For decades, supercomputers have helped scientists perform calculations that would not have been possible on regular computers of that time. Not only has the construction of supercomputers helped push the envolope of what is possible within the computing field, but the calculations supercomputers have performed for us have helped further both science and technology, and ultimately our lives. This post pays tribute to some of the most powerful supercomputers the world has seen, all the way from the 1970s until today. The first Cray computer was developed by a team lead by the legendary Seymor Cray. It was a freon-cooled 64-bit system running at 80 MHz with 8 megabytes of RAM. Careful use of vector instructions could yield a peak performance of 250 megaflops. 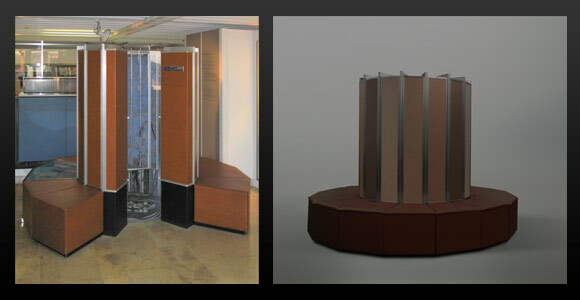 Together with its freon cooling system, the first model of the Cray-1 (Cray-1A) weighed 5.5 tons and was delivered to the Los Alamos National Laboratory in 1976. The famous C-shape was created in an effort to keep the cables as short as possible (the curve makes the distances on the inside shorter). Shorter cables allowed the system to operate at a higher frequency (80 MHz was insanely fast at the time). Above: The classic Cray computer C-shape in evidence, presumably there for performance, not to mimic the C in Cray. The Cray-2 was the world’s fastest computer between 1985-1989, capable of 1.9 gigaflops. Like the Cray-1, it was a 64-bit system. The first Cray-2 was delivered with 2 gigabytes of RAM which was considered massive at the time. Its circuit boards were packed in eight tight, interconnected layers on top of each other, which made any form of air cooling impossible. Instead a special electrically insulating liquid called Flourinert (from 3M, the company that brought you Post-it notes) was used to cool the circuits. 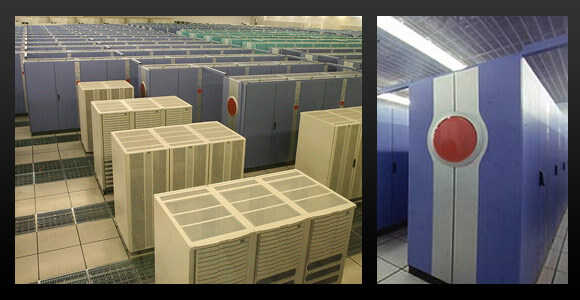 Thanks to the heat exchanger water tank that came with the liquid cooling system, visible in the pictures below, the Cray-2 earned the nickname “Bubbles”. Above: Note the cooling system’s heat exchanger water tank in the right picture. It earned the Cray-2 it’s “Bubbles” nickname. The CM-5 was part of a family of supercomputers by Thinking Machines Corporation initially intended for artificial intelligence applications and symbolic processing, but found more success in the field of computational science. A famous CM-5 system was FROSTBURG which was installed at the US National Security Agency (NSA) in 1991, operating until 1997. 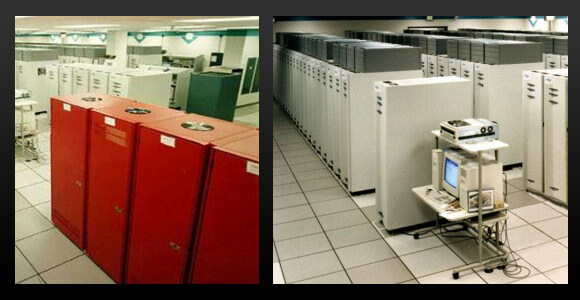 The FROSTBURG computer was initially delivered with 256 processing nodes, but was upgraded in 1993 to a total of 512 processing nodes and 2 terabytes of RAM. It used SPARC RISC processors and had a peak performance of 65.5 gigaflops. It had cool-looking light panels that showed processing node usage and could also be used for diagnostics purposes. A CM-5 was also featured in the movie Jurassic Park (in the island control room). Above: The CM-5 and it’s light panels in clear evidence. Cool enough to land it a role in Jurassic Park. Fujitsu developed the supercomputer known as the Numerical Wind Tunnel in cooperation with Japan’s National Aerospace Laboratory. As its name implies, it was used to simulate wind turbulence on aircraft and spacecraft, and also to forecast weather. The system was capable of 124.5 gigaflops and was the fastest in the world when it debuted in 1993. It was the first computer to break the 100 gigaflops barrier. Above: Used for among other things to calculate wind turbulence on aircraft, the Numerical Wind Tunnel looked quite aerodynamic itself. The ASCI Red, a collaboration between Intel and Sandia Labs, was the world’s fastest computer between 1997-2000. The original ASCI Red used Pentium Pro processors clocked at 200 MHz, later upgraded to Pentium II Overdrive processors operating at 333 MHz. It was the first computer to break the teraflops barrier (and after the processor upgrade it passed 2 teraflops). The machine had 4,510 compute nodes (with close to 10,000 Pentium Pro processors), a total of 1,212 gigabytes of RAM, and 12.5 terabytes of disk storage. 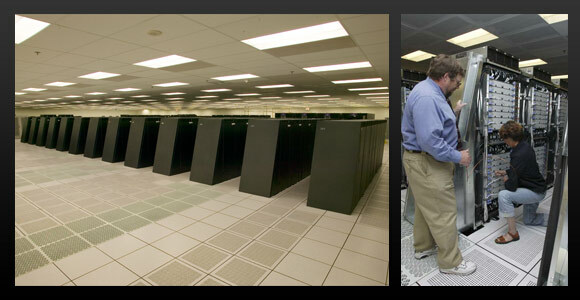 The upgraded version of ASCI Red was housed in 104 cabinets, taking up 2,500 square feet (230 square meters). ASCI stands for Accelerated Strategic Computing Initiative, a US government initiative to replace live nuclear testing with simulation. Above: The ASCI Red provided the computing power to simulate nuclear testing, doing away with live tests. ASCI White took over as the world’s fastest supercomputer after ASCI Red and kept that position between 2000-2002. Although similar in name, the ASCI White was completely different from ASCI Red. Intel had constructed the ASCI Red, but the ASCI White was an IBM system, based on IBM’s RS/6000 SP computer system. It housed a total of 8,192 POWER3 processors operating at 375 MHz, 6 terabytes of RAM and 160 terabytes of disk storage. The ASCI White was capable of more than 7 teraflops. Above: Fish-eye view of the ASCI White. The Earth Simulator was built by NEC for the Japan Aerospace Exploration Agency, the Japan Atomic Energy Research Institute and the Japan Marina Science and Technology Center. It was the world’s fastest computer between 2002-2004. The Earth Simulator is used to run global climate simulations for both the atmosphere and the oceans. Based on NEC’s SX-6 architecture, it had a total of 5,120 processors, 10 terabytes of RAM and 700 terabytes of disk space (plus 1.6 petabytes of mass storage in tape drives). The initial Earth Simulator was capable of a theoretical top performance of 40 teraflops, though “only” 35.86 teraflops have been achieved. An upgraded version of the system is still in use. Above: The Earth Simulator. 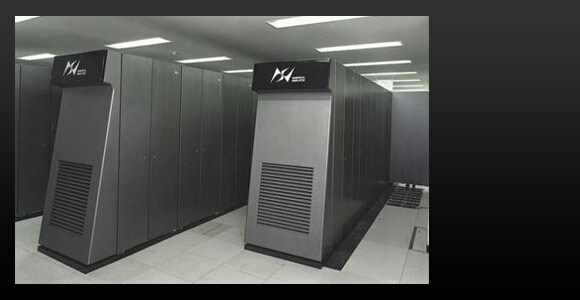 The Japanese seem to name their supercomputers very clearly by their purpose (judging by this one and Fujitsu’s Numerical Wind Tunnel). 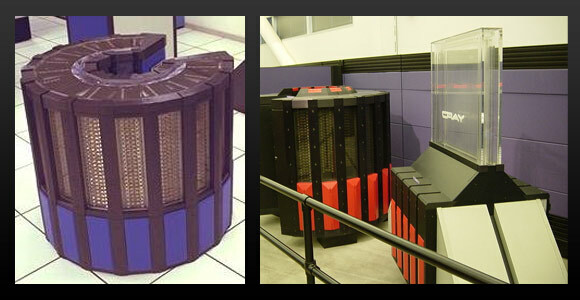 Above: This is the Blue Gene/L supercomputer that took over the performance crown from the Earth Simulator. 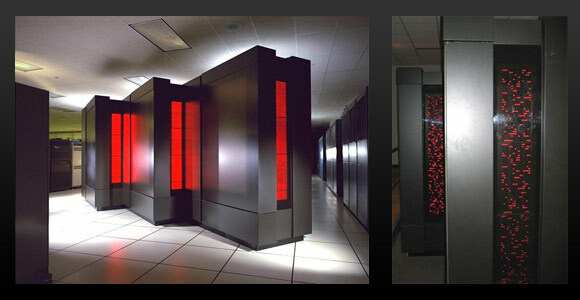 Located at the Oak Ridge National Laboratory, this Cray supercomputer is currently capable of 1.64 petaflops. The Jaguar has gone through several iterations, and is currently using Cray’s XT4 and XT5 architecture with quad-core AMD Opteron processors. It has more than 181,000 processing cores with a total of 362 terabytes of RAM and 10 petabytes of disk space. The Jaguar occupies 284 cabinets, and the XT5 section alone (200 cabinets) is as large as an NBA basketball court. With a performance of just over 1 petaflops, it was the second-fastest computer in the world in 2008. 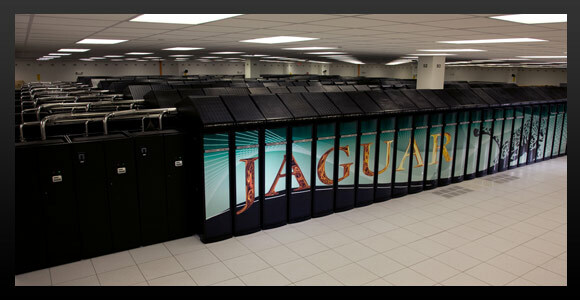 Above: The Jaguar supercomputer, 284 cabinets of hardware. The IBM Roadrunner is capable of 1.71 petaflops and has been the world’s fastest computer since June 2008 and was the first computer able to keep a sustained 1 petaflops performance. It has 12,960 IBM PowerXCell 8i processors operating at 3.2 GHz and 6,480 dual-core AMD Opteron processors operating at 1.8 GHz, resulting in a total of 130,464 processor cores. It also has more than 100 terabytes of RAM. 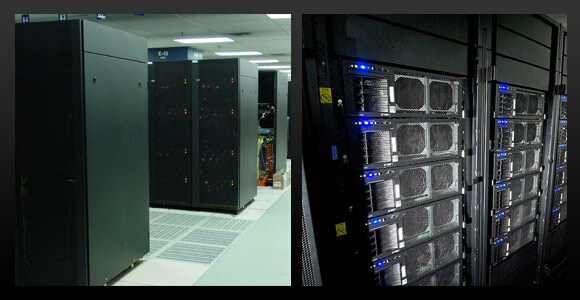 The Roadrunner supercomputer is housed in 296 racks and occupies 6,000 square feet (560 square meters) at the Los Alamos National Laboratory in New Mexico. Above: The Roadrunner fills up almost 6,000 square feet. It’s funny how although computer components keep getting smaller over the years, supercomputers just keep getting larger. And if you think these were impressive, just wait a couple of years. There are several projects in the works that will make these systems look like yesterday’s budget PCs. For example, IBM’s recently announced Sequoia is set to become the flagship of IBM’s armada of supercomputers. If things go according to plan, it will be capable of 20 petaflops by 2011, about 20 times faster than today’s most powerful supercomputers. Cray-1 1 and 2. Cray-2 1 and 2. CM-5 1 and 2. Numerical Wind Tunnel. ASCI Red 1 and 2. ASCI White. Earth Simulator 1 and 2. Blue Gene/L. Jaguar. Roadrunner 1 and 2. By the way I agree with Irky above. The CM-5 looks great! I’d put that one in my living room (probably the only place it would fit, anyway). ya, but how many frames / second does it get in unreal tournament? Very cool list. It would be interesting to know what these all cost when they were made. @Andrew: Oops! Thanks for pointing that out. Fixed. You’re missing an important metric. Power. E.g. the Cray Jaguar requires ~7 Megawatts whereas the faster IBM Roadrunner can get by on a measly 2.4 Megawatts. That’s okay Steve – I remember seeing pictures of the Cray 1 in a magazine while in our highschool library just after it had been released. Anyone remember the Transputer and Occam programming language (early 90’s)? Pretty cool in its day – I believe Scotland yard ordered a T-based system for frigerprint recognition. Anyone have any idea of the effective throughput of grid-based systems like SETI@Home or Folding@Home? I wonder if anyone has thought about trying to implment a climate-modelling system of similar design. And what are doing this little computers? 372,019 active CPUs providing 4,578 teraflops of software computing power. The Cray “Jaguar” consumes more power than the IBM “Roadrunner” mainly because Jaguar has a much more powerful memory subsystem and memory eats up a lot of power. The benefit is that Jaguar can tackle a wider range of problems, including memory-intensive ones. No one supercomputer design is best for all problems and there’s no free lunch. Haha, thats amazing, I wish my pc was that fast!!!! can i play counter strike 1.6 in one of theese computers? i mean, can i plug my usb mouse in there? Also heard about an Super computer using PS3’s. Mayby not an top-10 performer. I have seen less Intel processors used in super computers and i have not seen any Intel processors in the latest super computers. Can i know why. They haven’t because they are costly. India got into 13th place in super computing power and i think we can be in top 10 at any time. They should make a supercomputer which can design new and better supercomputers, which in turn can make even better supercomputers. The singularity is nigh…. Whow, they aren’t just super fast, but many of them look cool too. Very nice. Some look like the “Starwars” set. What do they use these supercomputer for? I’ve Heard of the IBM Roadrunner. What about IBM Big Blue?